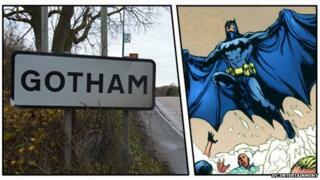 Batman enthusiasts are thought to be behind the latest disappearance of a village sign in Nottinghamshire. Gotham, which shares its name with the comic book superhero's home city, has had its sign stolen three times in four years. The parish council said it was "infuriating" that people, thought to be Batman fans, kept taking the signs. The last theft was in October but the county council said it was recently replaced before being taken again. "I think it is people taking them as souvenirs or collecting memorabilia but it is infuriating," said parish council chairman Mike Shepherd. "We are now sign-less on that road into the village." He said villagers had been hounding Nottinghamshire County Council to replace the sign after it was taken last year. "The council said they had replaced the sign but no-one saw the council reinstating it and no-one saw anybody taking it." PCSO Anthony Davies told the Nottingham Post: "It is of little scrap metal value, so it may be more to do with a prank, particularly given the name on it. "But it is not a prank because it is going to cost Nottinghamshire County Council money to replace it."